This is an easy free crochet placemat pattern that will suit the decor of any home. Beginners can work this half double crochet design, ending after the first round of the border. More advanced crocheters can work the rest of the border—a unique scalloped edge that combines short v-stitches with large puff stitches for a bold look. You can also use the instructions for the crochet edging to create borders on other projects, such as crochet dishcloths or even blankets. This easy crochet pattern is made using worsted weight cotton yarn and a size H / 5.0 mm crochet hook. The yarn used in the sample is Lily Sugar 'n Cream in the color way called Butterfly Ombre. It has about 95 yards per ball and the placemat requires two full balls of the yarn. A tapestry needle is optional, but it is helpful for weaving in ends when you are finished crocheting your project. The starting chain for this crochet placemat is 43. Work one half double crochet (hdc) stitch in the third chain from the hook (counts as first hdc of row). Work one hdc in each of the stitches across the row for a total of 42 hdc stitches in row 1. Row 2: Chain 2 to turn (counts as first hdc of new row). Work one half double crochet in each hdc across. Rows 3-25: Repeat row 2. This completes the main body of the placemat. Now it is time to add a border to complete the project. Chain one. You will begin to work down the side of the placemat, working all the way back around to where this first stitch is. Work 25 evenly spaced single crochet stitches down the side of the placemat (one per row). If you’re right-handed, this will be the left-hand side of the placemat; if you’re left-handed, it will probably be the right-hand side of the placemat. Chain two. This creates the corner. You should now be working on the opposite side of the starting chain. Work one single crochet stitch into each stitch of the starting chain (total 42 single crochet on this side). Chain two. This creates the next corner. Work 25 evenly spaced single crochet stitches up the side of the placemat (one per row). This will be the right-hand side of the placemat if you're right-handed. These stitches should be directly across from those on the left-hand side of the placemat. Work one single crochet stitch into each stitch of the top row (total 42 single crochet on this side). Chain two for the final corner. Sl stitch into the first chain to join and complete this round. 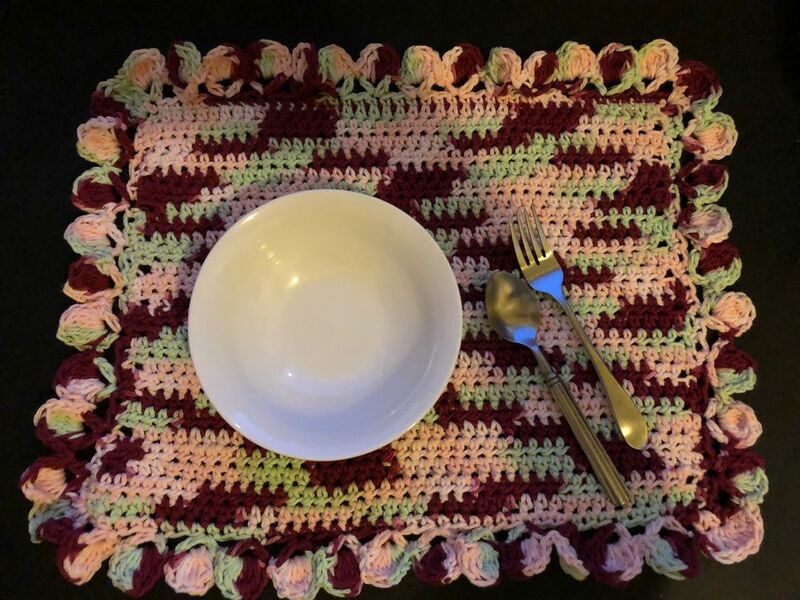 At this point, the crochet placemat may be complete, either because you want a simple border or because you are a beginner crafter and don't want to attempt the scalloped edge that follows. (A simpler alternative might be the crochet shell stitch border.) This is a perfectly beautiful crochet placemat with a single crochet edging. If you are happy now, end off the work and weave in ends. Otherwise, proceed with the steps below to continue with the scalloped edge. This is a shorter variation of the classic crochet v-stitch. Repeat step 3 six times. There should be 7 loops on the hook. Yarn over, pull through all seven loops on hook. After completing your single crochet border, your crochet hook should be in the top left corner of the placemat (as a right-handed crocheter). Following the instructions above, make one hdc v-stitch in next stitch. Ch 1, skip next 2. Repeat steps 3-4 across side of placemat. When you reach the corner, work 3 hdc in the ch-2 space that makes the corner. Repeat steps 3-4 across bottom of placemat. Repeat steps 3-4 across the second side of placemat. Repeat steps 3-4 across top of placemat. Work 2 hdc stitches in ch-2 space. Slip stitch to top of chain 3 to close round. Slip stitch into the place before the next hdc v-stitch. Following the instructions for special stitches above, work one puff stitch into the chain space of the hdc v-stitch. Repeat across side (puff stitches in the v-stitches, slip stitches between them). When you get to the corner, work 2 dc into each hdc (for a total of 6 dc in corner). Repeat the pattern all the way around (puff stitches in the v-stitches, slip stitches between them, 6 dc in each corner). Slip stitch to first single crochet to close round. Your finished crochet placemat, which measures out at approximately 14" x 18" (varying depending on your own yarn and crochet tension), is now complete. You may wish to make 3 or 5 more to have a complete set of matching crochet placemats for your dinner table. These placemat sets also make a great gift for others.